The Benalmádena Cable Car (Teleférico in Spanish) is about an hours drive (approximately 50 miles) from Nerja, and is just off the A7 coastal motorway. 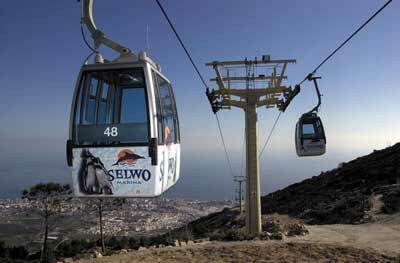 The cable car goes up Monte Calamorro and gives spectacular views from 800m above sea level. The trip itself lasts 15 minutes or so in the comfortable and modern cable cars and is suitable for all ages. From the top of Mount Calamorro you can see as far as the Sierra Nevada mountains to the North East and on clear days you can see as far as Gibraltar and even the coast of Africa. For cable car customers there are daily displays of birds of prey, such as hawks, eagles, owls and vultures. If you like walking the top has nearly 3km of clearly marked trails, which lead to different viewpoints that offer a unique panorama of the Costa del Sol. To get to the cable car take exit 222 from the A7 Autovía Costa del Sol, Benalmádena-Arroyo de la Miel. In the summer months, the cable car is open from 11am until midnight. The rest of the year the cable car stays open from 11am until 5 to 7pm. The cable car is closed during part of January. Ticket prices are €13 return trip for adults and €9.80 for 3-9 year olds. Combined entry tickets are also available for the cable car, Selwo Adventure Park and Selwo Marina. Prices and opening times are for 2012 and are correct at time of publication, but please phone first to confirm before travelling.